One of the main features of the Talent Community section is the ability to save a search so you receive email job notifications. After a saved search is created any jobs posted to the career website that match your search will automatically email to you. Create or sign in to your Talent Community Account by clicking the "Sign In" link located in the top right of the page. After you sign in, visit the Current Openings Page. 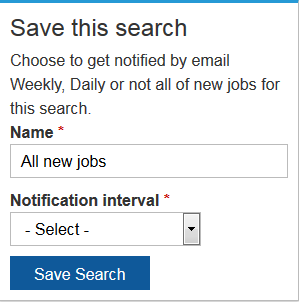 To set up a Job Notification for ALL new jobs simply select an option in the "Notification interval" box and click the blue "Save Search" button. We recommend users customize job notifications using the search filters located on the left side of the page and/or a key word search. Sign in to Talent Community Account. 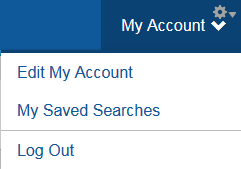 Hover over the "My Account" tab in the main navigation menu. Click the "My Saved Searches" tab. From here you can edit your saved search or choose to delete it but clicking the appropriate box.